Location: "Green Wood" hotel is located only 6 km. from Bansko, 3 km. of Razlog and 2 km. by Katarina. The hotel has its own shuttle to the ski slopes of resort Bansko. Only 500 meters from the hotel is the golf course "Pirin golf with 18 holes designed by world famous Ian Woosnam. 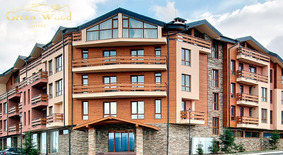 If you are looking for a golf hotel in Bansko, near the beautiful area Katarino - "Green Wood" is the right choice. Accommodation in the "Green Wood" Hotel Bansko: As a year-round hotel "Green Wood" can offer accommodation in 28 double rooms, 53 studios, 19 one bedroom apartments and 6 two bedroom apartments. Each of the rooms in the complex is furnished in modern style to the highest requirements in the industry, and for your additional comfort each room has a fully equipped kitchenette, 22 "LCD TV, DVD, Internet access and more. Wine & dine: The restaurant offers exquisite dishes of European cuisine, but as a hotel in Bansko and want to showcase dishes of national cuisine of Bulgaria, and a rich selection of wines. The lobby bar is where you can combine relaxation of their skiing or golf activities, a cocktail or favorite drink. Opening of the Spa Center Soon! Ask at reception for opportunities to use the spa center in the region. Negotiated preferential rates with an adjacent complex. Hotel "Green Wood", as a golf hotel in Katarino is located only 500 meters from the golf course Pirin Golf. Skiing enthusiasts will be fascinated - just 10 minutes, Bansko will offer the best ski slopes in the Balkans with a length of 65 km., A modern gondola lift with a capacity of 2.400 people per hour, and many other activities. Other services offered are hotel parking, security, safe, room service, ironing, transfers, shopping area, nursery, organization of excursions, etc.